In DLR’s department for Simulation and Software Technology, a virtual-reality simulation of our solar system is being developed. 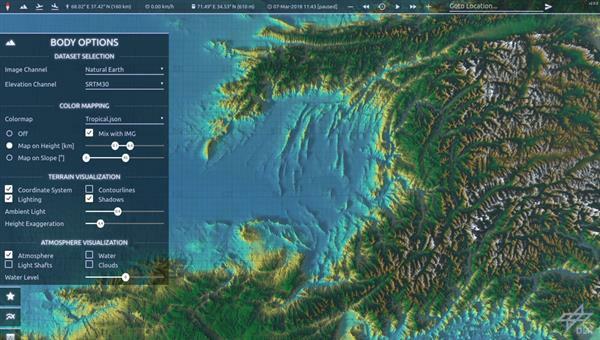 With sophisticated level-of-detail-algorithms, high resolution digital elevation models and satellite imagery, entire planets and space missions can be explored in real-time. Light and shadow play an important role in realistic space simulations. However, conventional approaches such as cascaded shadow maps are not suitable for many scenarios. This is especially true for scenes like in the screenshot above with a narrow sun angle, many small details, short shadows and a small depth range. In these cases, other approaches such as screen-space shadows are very promising. In the scope of this thesis, a survey on existing screen-space soft shadow (SSSS) algorithms shall be performed, taking into account the specially demands optimization opportunities of 2.5D terrain rendering. The most promising algorithm(s) will be implemented and optimized for this special use-case. Finally, tests and benchmarks shall prove the efficiency of the implementation and the limitations of the approach shall be discussed in detail. Innovation is at its greatest when men and women carry out research together. A good example of this – DLR!